Margaritaville, as much a state of mind as a place! This full-menu establishment caters to those searching for a good meal and a good time. This Caribbean-styled restaurant serves the flavors of the tropical islands in 5 distinctive bars and two outdoor patios. Margaritaville is as much a state of mind as a place! This full-menu establishment caters to those searching for a good meal and a good time. The Caribbean-styled restaurant serves the flavors of the tropical islands in 5 distinctive bars and two outdoor patios. Enjoy Mahi Mahi, salmon and other seafood delights, a juicy steak with pineapple salsa or simply a “cheeseburger in paradise”. Kick back on one of the outside patios, sip a beverage at one of the lively bars, and have a memorable Margaritaville experience. Visit the large retail store and bring home a bit of Margaritaville! 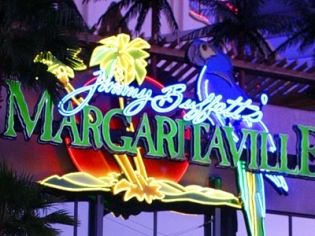 Not just for parrotheads, Margaritaville is for the party lover in all of us! The portions here are massive. Volcano nachos are huge! Cheeseburger in Paradise and Margarita are a must! Fun casual place! This place is usually my first stop when I get to Vegas! Huge portions! Their nachos are over the top, great drinks. Server was extremely nice and the place was fun. We asked for more lines to go with our beer and they brought out old dried out limes. We asked for new limes and the second batch was not an improvement. For a margarita place you would not expect them to skimp on the quality of the likes. Ordered shrimp fajitas and the shrimp was overly seasoned. If it wasn’t so salty it would have been good to eat. Suggestion: to keep limes fresh do not cut more than you need for the day of service. One of my most favorite places to eat! Entertainment and atmosphere alone are well worth it, then throw in some really tasty dishes and its tops for me! Great food and drinks overlooking the Vegas strip! Very reasonable. Can be alright place if your wanting loud and food. A party restaurant not for the romantic moments. Go with your buds and enjoy.